is being pulled by her dog and her cat. girl has tied the wagon to her dog's collar and to the cat's testicles. right, but then I wouldn't have a siren." 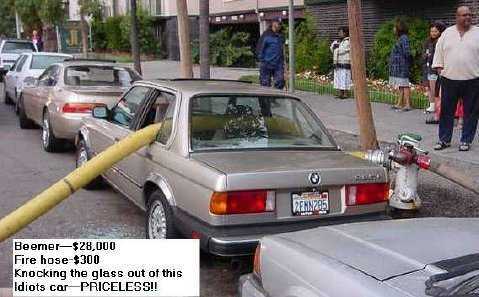 Didn't your parents teach you NOT to park in front of fire hydrants??? Be sure to read it with a Southern Accent! here, 'The three wise man came from afar!" $50,000 to the fire department that brings them out intact." on film, asking the chief, "What are you going to do with all that money?" gonna do is fix dem brakes on dat damn truck!"